I started out today with intentions of working on tiny stars. 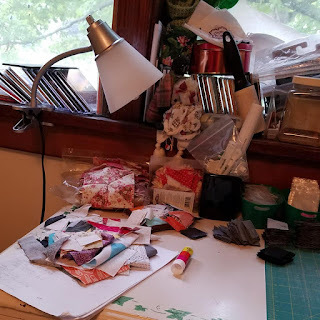 I walked into the sewing room and realized I'd left myself a mess. Odds and ends that were dropped off while tidying up elsewhere that needed to be put away or have homes found. So I tidied up in there. Okay - NOW tiny stars. Well, I should probably cut pieces from the bin of fabrics from my finished UFO for this month first. I can tidy the room more by emptying the bin and putting stuff away. And I'll have a few more tiny stars in the to-do bin, so that's always good. Okay...wait...I should cut binding strips from the leftovers! Unfold, cut, refold. The stack of fabrics was won in a silent auction in the fall of 2016. A gal in our guild held a sew-in fundraiser at her church for the youth ministry. They were heading to Scotland and since her son was on the roster to go, she helped organize this. A nice bundle of 30's fabric screamed at me until I outbid her. Now the leftovers (more than half the fat quarter for many of them) are going to her just because. Well, I should probably sew those binding strips together, but Emma says it's lunchtime. And Emma will make every effort to halt all human activities when she's hungry. Might as well eat. And feed Emma (and the other cats). Well, there's that fabric I bought to back the Christmas squirrel quilt and the deadline for turning things in for the bazaar is coming quickly, so I should probably piece that back first so I can quilt it sooner rather than later. So I pieced the back. 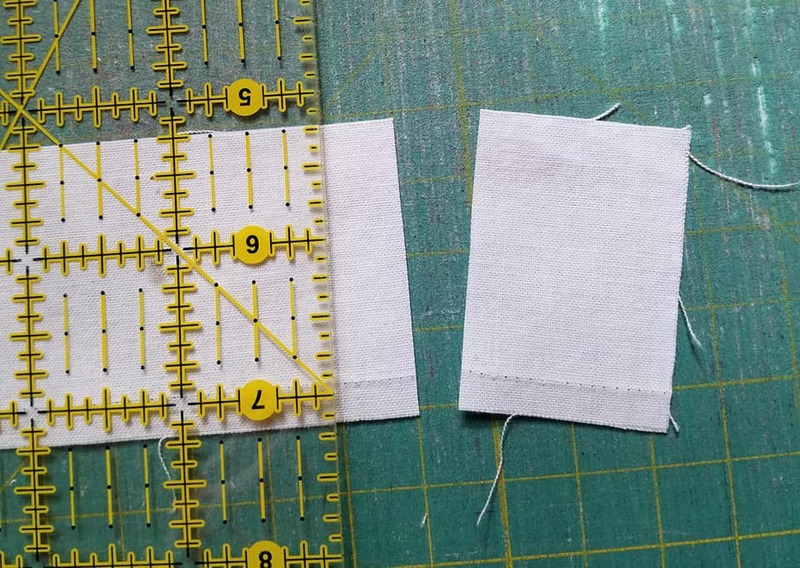 I hate long seams, but that wasn't TOO hard. No, silly, you have to piece and press the 30's binding. But you should probably decide on a fabric and cut, sew and press the Christmas squirrel binding while you're at it. So I did. How about a blog post? So, no tiny stars, but I'll finish the tale of the UFO. 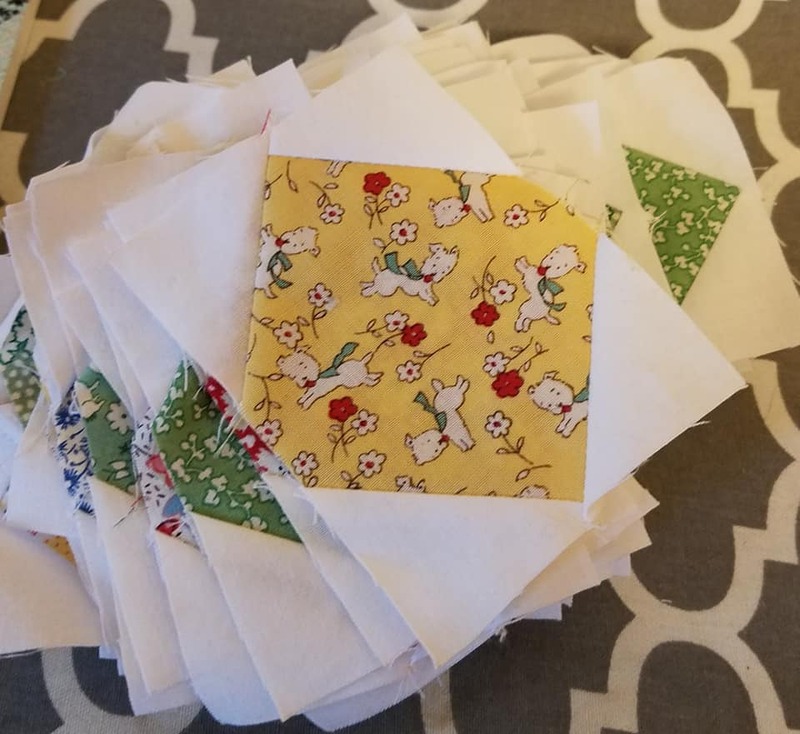 It all started, as I said, back in the fall of 2016, when I purchased a bundle of random 30's fat quarters. 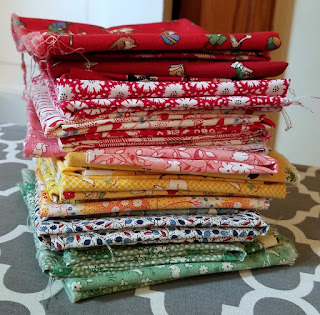 I say random because they were from all sources, collected over a period of time, not just one line, and culled from a whole-stash donation by a quilter who was no longer able to quilt. They sat a little while in my stash, waiting for me to decide what project to make. I settled on the pattern Candy Bracelets from the book "Scrap-Basket Strips and Squares" by Kim Brackett. ...and cut some pieces, but didn't do much else. I was kinda discouraged because my border, a pieced monstrosity of my own creation, was daunting. 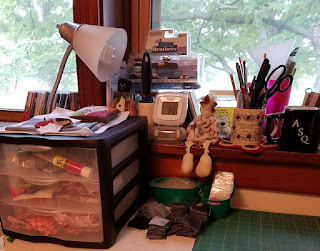 A few weekends ago, I went to sew with my sister-in-law and had nothing really easy to pack up and take with me. So I decided I'd work on these border units. I came home with the units all made! The next step was a hard one. Not because it was actually difficult, but because I have cats. I had to lay these out - 15 on the short sides, 17 on the longer sides - to get an even balance of colors. BEFORE the cats came to help! And one day, when I realized I had 7 minutes until I had to leave for work, I did it. It forced me to be faster than the cats, but it also helped me to not overthink placement. Yes, there might be a yellow near a yellow, but as long as it wasn't the SAME yellow, I'd be fine. I still had to sew the units together, but that shouldn't be hard. I even pressed the units so the seams would nest. Ha! Right. I intended for the points to be cut off, no worries, but the seams matching was a nightmare. I mean, they're pretty close, and some are great, but I was not in a mood to fight with these, so I didn't. Much. 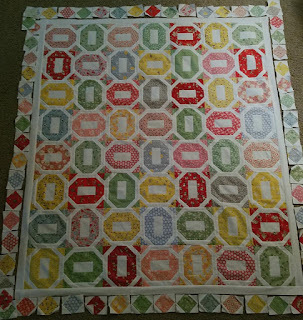 And then I decided it needed another white border around the outside to anchor those pieces in the border. 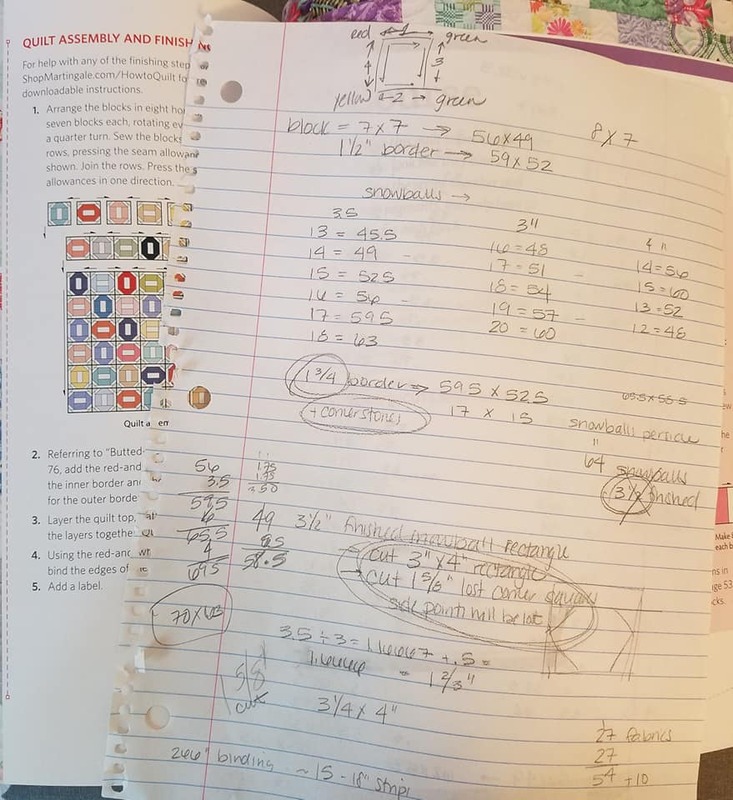 And I mathed wrong. So off came the offending borders. 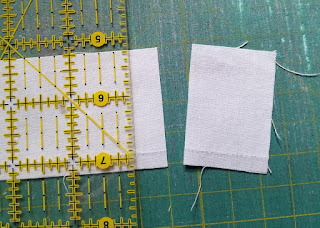 I think I spent more time picking thread bits than I did actually ripping. But regardless, it didn't take TOO long. More time than I would like to have spent, but it was needed. Borders were put back on, again taking less time than my brain thought, and the quilt is better. 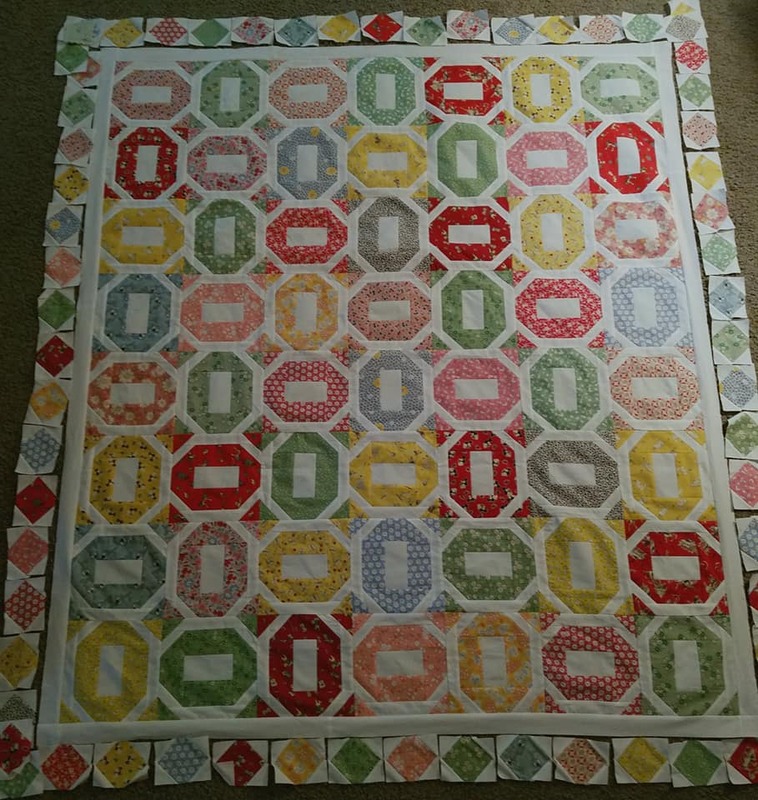 It still has some problems, but they all seemed to happen AFTER the blocks in the center, so I'm going to baste on the longarm starting with the inner portion and am confident I can quilt out the remaining waves. I don't think it's THAT off. And then I looked at those blue cornerstones, so earnestly placed, and thought "WHAT?" I don't like them, but they're staying. This quilt has gotten more than its share of unsewing attention. So there you have it, the UFO for this month is finished. It was actually done a few days ago, but I had other adventures to blog about. You can see the windowsill area storage was also tidied up and that mess was the fault of no one but me. But you know how it is when you just want to start sewing and you've been tidying up for too long. You just start putting things wherever. I'm trying hard to be more responsible about my tidying, but it's not always easy! I'm also trying to keep the things sitting on top of the bin to a minimum, as I know those will eventually be launched, too. 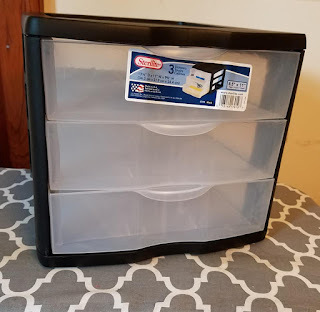 I put some grippy material under the drawers, too, to keep it from sliding not only when I use it, but when it is used as a launch pad. So far, so good! I love cats too; had several over past years, but what you've just described is part of why I don't have one now. I can make big messes (and leave them!) without the help of any pets or people! 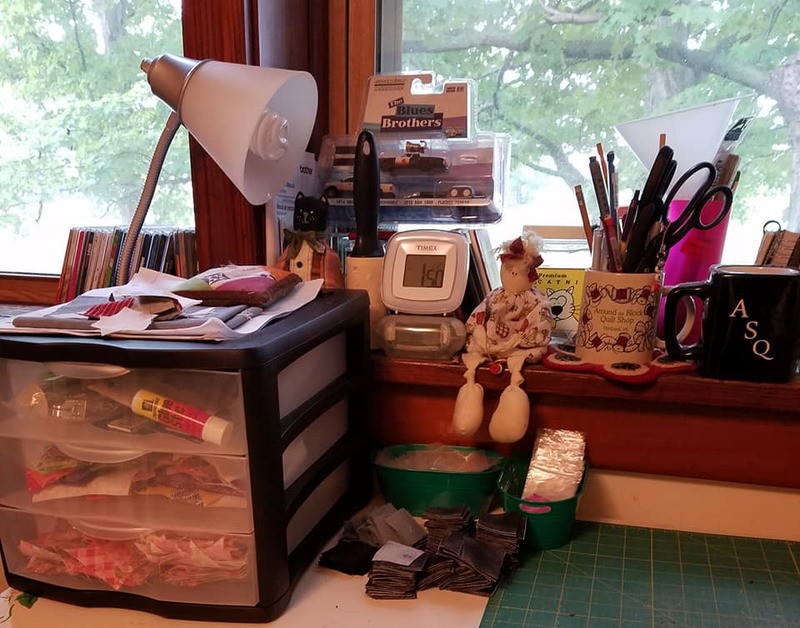 I have a little cabinet similar to yours in my quilting closet, and it works well for me. Just so you know, I love your new flimsy! It is so cheerful! Can't wait to see how you quilt it. ---"Love"
So, about those tiny stars....... you’re too funny! You certainly can’t be accused of not being industrious. 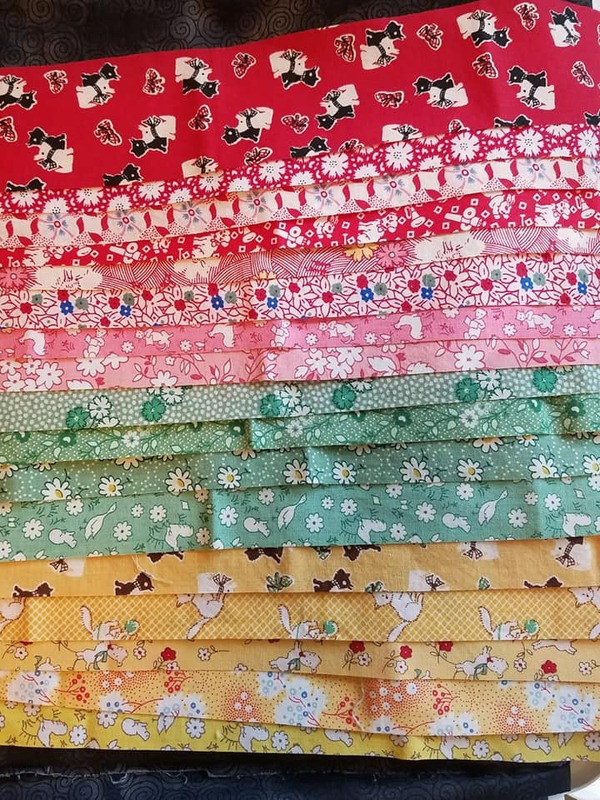 That’s such a lovely quilt and the unpicking is all too familiar. Funny kitty kats! Geez, and I was having troubles with just ONE bag... you'll get to the tiny stars - some day -. You go like the Energizer Bunny! ! ! Candy Bracelets is so cute and colorful! 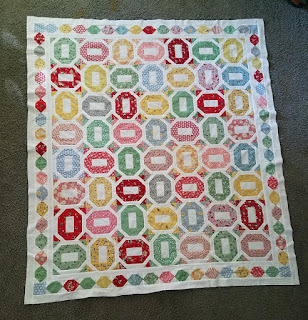 I love the 30's prints, they make cute quilts. You managed to get a lot done in the time you had. With all that out of the way, are Tiny Stars next? ! ? Tidying up is a constant thing and never lasts very long for me. My sewing room is a disaster area and like Love, I do love cats, but am glad I don't have one now. I don't need any help launching scraps onto the floor! 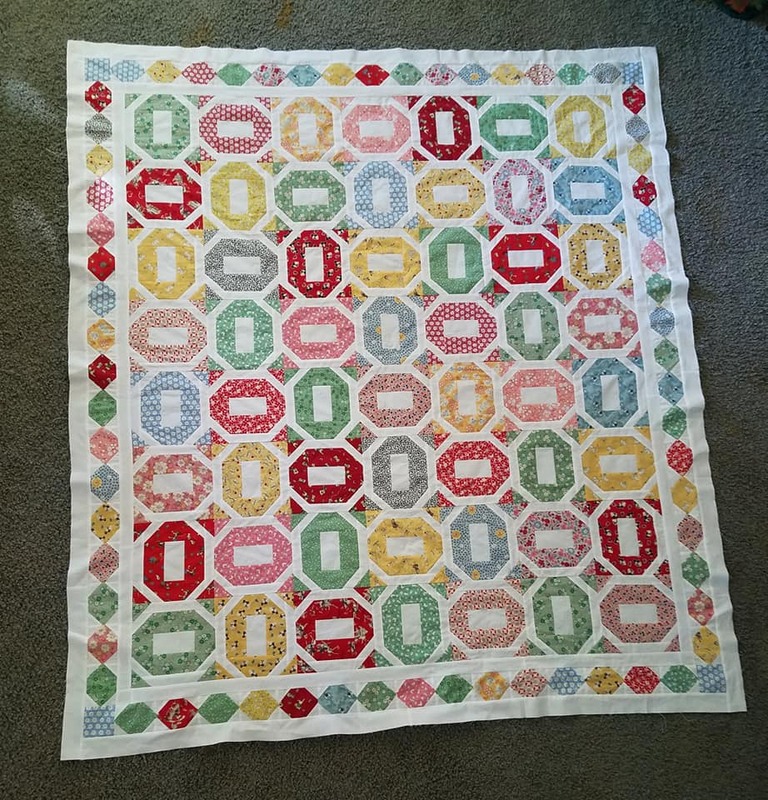 Love the 30s quilt top! 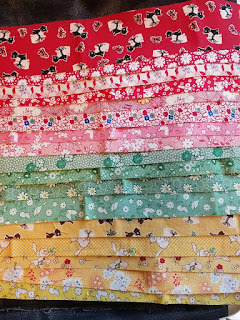 I makes me think of a pattern I have somewhere for a 30s quilt. 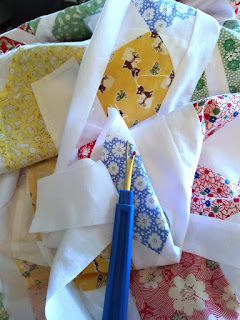 I have never made a large 30s quilt and don't know if I ever will, however, I do have quite a bit of 30s scraps and would like to get them used up. Maybe a smaller quilt like a lap quilt would be better for me.